Kent Finlay's influence on Texas country music artist Randy Rogers of the Randy Rogers Band can't be overstated. "There is no Randy Rogers Band without Kent Finlay," Rogers notes matter-of-factly. Rogers took Finlay's mentorship and friendship to heart, so much so that he purchased Finlay's music venue, Cheatham Street Warehouse in San Marcos. Now Rogers pays it forward as a mentor to young artists in the same way Finlay mentored Rogers up until Finlay passed in 2015. George Strait, Stevie Ray Vaughan, and Rogers himself, all cut their teeth performing at the Cheatham Street Warehouse, with countless other songwriters starting out at the open mic Wednesday night Songwriter's Circle. We recently spoke with Rogers about his work with Texas State University and its Center for Texas Music History's Kent Finlay Endowment, providing scholarships for students to pursue music business studies. Rogers and his bandmate Geoff Hill perform an intimate acoustic peformance on Sunday, December 9th at Seekatz Opera House in New Braunfels, TX with proceeds from the event being donated to the Kent Finlay Endowment. Texas Music Office (TMO): Can you tell our audience how you initially met Kent Finlay? And what those early days were like when you first started performing at Cheatham Street? Randy Rogers: "Yes. In 1999, he had reopened Cheatham Street, and he was hosting open mic nights on Wednesdays. I heard an ad on the radio station, KCTI. So I took my guitar down there. Signed up. Got up, and sang some songs. "He checked in with me afterwards, and invited me back for the next week. We became friends. I went religiously to open mics for a year before I started my own band. He gave me Tuesday nights at Cheatham Street…which had previously been (a residency night for) George Strait and Ace in the Hole, Stevie Ray Vaughan, and lots of others through the years have had that Tuesday night slot. "I was really honored. He challenged me to start the band…and the rest is history." TMO: So he challenged you? Were you coming in as a solo songwriter? Or were you performing with Jeff back then? Rogers: "I was just a singer-songwriter…I hadn’t met Jeff at that time." TMO: Tell us about how he challenged you? Did he suggest you get a band together? Rogers: "Yeah…he said, ‘Hey, if you can get it together, I’ll give you Tuesday nights.’ We met for several lunches and talked about how to do that. And, if there wasn’t a Kent Finlay, there wouldn’t be a Randy Rogers Band." TMO: When you heard the ad on the radio, was that different than his songwriter’s circle nights? Or was it the same? Rogers: "That’s what it was…the songwriter nights, on Wednesday nights. And it’s still going on. I own Cheatham Street Warehouse now, and we still have the songwriter night on Wednesdays…"
TMO: It sounds like a lot of artists that have gone on to have long careers, started some of the first performances at the songwriters night. Are you seeing any artists come out of it more recently that are making a transformation similar to yours: beginning as a solo performer and then growing…and performing bigger shows with a full band? Rogers: "Yes. Parker McCollum played there every Tuesday a year ago, and his career has taken off. Mason Lively is playing there now on Tuesdays, and he’s doing well all over the place. So yeah, we’re still open, the music is loud, the beer is cold, I feel like I’m doing my part in keeping Kent’s legacy alive. And that’s what this fundraiser, which actually is to fund an endowment at Texas State University – the Kent Finlay Legacy Endowment – so that kids can receive some money as a scholarship in Kent’s name to keep his spirit alive. He loved the university. He taught at the university. He loved his students. And this is just a way to make sure that people know, forever, that Kent Finlay impacted so many lives. Musicians like me, and people that love the music industry, whether they write about it, or are on the radio…all aspects of the music industry." TMO: So the endowment scholarships will be open to people studying about how to work in the music industry in a variety of ways? Rogers: "Exactly. It’s not just necessarily for music majors, or history majors…it’s open. So if you show any kind of interest in the music industry, you can take any kind of elective class revolving around…it can even be journalism. If you have any interest (related to the music industry), you can apply for the scholarship. They’ll be a committee. And the idea is to get the endowment so large, that you can actually make a huge impact in someone’s life, in Kent’s name. So that’s what we’re after." TMO: That’s amazing. Did the idea for the endowment begin with the school, or from Jenni, Haleyanna, and the rest of Kent’s family? Rogers: "You know, back in the day. They set one up. And I was approached by the university, a lady named Laura Murray…and also Darcy Hardy. And it was my understanding that how the original endowment was set up, it was very limited in the growth that the endowment could have. And so, basically, we – I don’t really know all the politics of it and the red tape work – but helped the university to create a new endowment that has more potential to earn, so that we can actually help more students. And basically give more scholarship money away to students. That’s how it all came about…"
TMO: Obviously you were very close with Kent, and he was a big influence on your career…but how was he different from other venue owners. What was different about him? Rogers: (laughing) "He was different in every way possible. He was not a scum bag (Rogers jests). He was not trying to steal from you (Rogers says jokingly). He had morals." "Sorry...I still get kinda choked up thinkin’ about him." Rogers: "Well it’s the one thing that I know how to do. I’ve always approached the music business as a business. And after 18 years of touring, I’ve seen lots of places fail. So I think I know how not to fail. I think that’s key. "But I’ve always enjoyed the creative side of music and the industry. But I also know that’s not going to always pay the bills all the time, and so I’ve always approached music as a business. And Kent Finlay was the first person that taught me that, to be honest. To get my publishing in order. To take care of copyrights. To be sober enough to settle your shows (at the end of the night), so you know you’re not getting ripped off...(those were the kind of lessons) that he instilled in me when I was just a young pup." TMO: That’s great to have that kind of mentorship, because so many musicians make mistakes early on. Lastly, can you tell our audience what to expect at the benefit concert. Will there be any special guests? Will this become an annual event raising funds for the endowment? Rogers: "Well the endowment can get as big as we want it to…that’s the goal. You can only provide 4% of the trust as scholarship money. So the goal is to get as big as we can get it…so we can really make a difference. "And absolutely, this won’t be the last fundraising effort that I participate in and work with the university. I was recently awarded a Young Distinguished Alumni Award from Texas State, and I’m very proud of that. And I’m very proud to work with the university to keep music on the forefront there…and to also help out kids like myself (when I was a student). I had student loans, and debt, and all kinds of struggles working 2 or 3 jobs…still trying to play music and finish my degree at the same time. And so…$1,000 (in scholarship funds) could have changed a lot for me back then. So we’re trying to do the same thing." 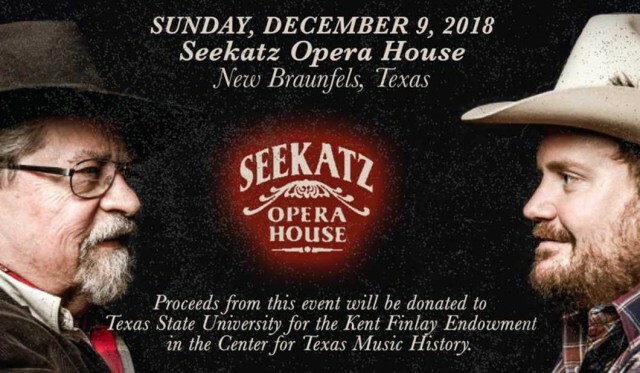 Randy Rogers and his bandmate Geoff Hill perform an intimate acoustic peformance on Sunday, December 9th at Seekatz Opera House in New Braunfels, TX with proceeds from the event being donated to the Kent Finlay Endowment. Interview conducted by TMO Marketing & Communications Specialist, Marc Fort.